In local news, my father noticed this hole in a pipe near Pixie Falls. 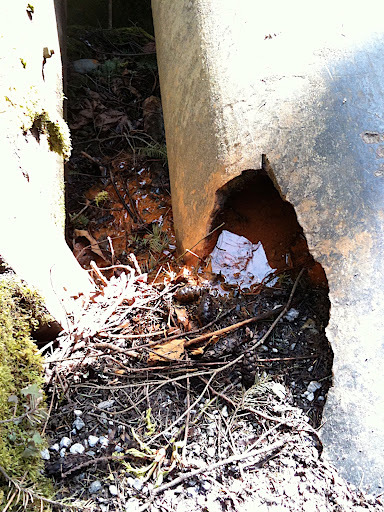 Looks pretty gross— iron, oxidizing from the inside of the pipe, dumping right into Whatcom Creek? The same Whatcom Creek that people fish beneath Dupont and C Street? I guess that the Olympic Pipeline disaster didn’t stop them to begin with, but, again— pretty gross. In global news, pretty disturbing to come home to news of poor Poland’s terrible tragedy. The extent of the experience lost alone is devastating— looking at the list of people who died and thinking about the psychohistorical significance of the place it occurred, it’s akin to Barack and Michelle, Hillary Clinton and two of her deputies, Rahm Emmanuel, Mike Mullen, all of the Joint Chiefs, the head of the NSA, a famous actor in his seventies (Robert Redford? ), multiple famous historians (Ken Burns? The Team of Rivals guy?) and a group of Bataan Death March survivors and their relatives all dying in a plane crash flying into the Philippines to attend a commemoration. Only, really, the analogy breaks down at the psychohistorical point; I can’t think of anything like Katyn as close to our own borders and involving a neighbor with whom we have as complicated a relationship as the Warsaw-Pact-plus-things-like-Katyn-and-Solidarity Poland-Russia cagematch. Very sad day— cross your fingers that it was “just” a plane crash and not something that lends itself to conspiracy in the least.